Design firm Alessi has been hugely influential, the Alessi family turning their metal-working business into one of the most important design companies in the world. Their iconic and instantly recognisible designs, from corkscrews to lemon juicers, have brought style to functional objects that now grace millions of homes. La Signora Eugenia e il passero solitario is the wine label of Alberto Alessi, pictured right and President of Alessi. 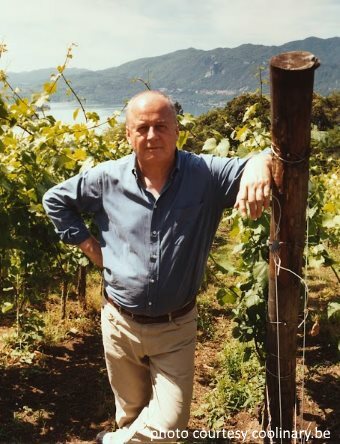 Owning a wine estate is somthing he says he always dreamed of and, when a property on the shores of Lake Orta, not far from Lake Maggiore in the Italian Lakes, came on the market, he acquired it. Though historically a fruit farm, the property was in a state of “almost complete neglect,” bush and weeds having taken over. Between 2001 and 2003 this was cleared, and vineyards planted at an altitude of 370 to 425 metres. Possibly only the scion of such a rich industrialist family could have imagined this project, in an area of relatively high rainfall, where no other commercial vineyards exist for the production of wine. And perhaps even more brave, the vineyards are both organic and biodynamic, planted on granite soils, in an operation that appears to be working very closely to the ideals of the ‘natural wine’ movement. Production is tiny, with only a few hundred bottles of each cuvée, individually numbered and, as befits the Alessi ownership, the most striking and original bottles. Drawing inspiration from Leonardo da Vinci’s Vitruvian Man, the striking conical bottles were designed by Alessi and carry da Vinci’s ‘knot’ motif embossed around the base,. 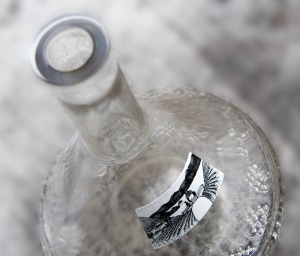 The logos, labels, and packaging are by Catalan designer, Martì Guixe and Alessi hopes that each one will be treasured and re-purposed once the contents have been consumed. The wines are extremely expensive and very difficult to source, the only outlet I can see being the web site of La Signora Eugenia e il passero solitario. And don’t worry: although the bottles do not fit any standard wine rack, you can buy a purpose-designed racking system tailor made to house them from Alessi. The packaging is indeed stunning, but I have to say, I was very impressed by the wines too. The vineyards appear to be planted entirely to Pinot Noir and Chardonnay (I say ‘appear’ because there is scant information about the wines and operation, even having pored over the whimsical website for the operation). This makes me think that Signor Alessi must be a Burgundy fan, but then the wines really are very un-Burgundian and do march to quite an unsual beat, guided by a team of viticultural and winemaking consultants including biodynamic guru Jacques Mell. Each wine gave real pleasure and bucket-loads of interest though, whilst I have to admit the price tag is high at between 100 and 250 Euros per bottle. In the end these wines appear to me to be much more than a rich man’s folly or fashion statement: they are obviously being made with great care and skill, and would hold their own extremely well if tasted blind, even without the Alessi design imprimatur. (2019) The Pinot Noir was sourced from six small plots chosen for their different characters and ripeness. Partly whole-bunch fermented, only using indigenous yeasts, the wine was matured in second- and third-fill French oak barriques for 18 months. What a lovely nose, deep spicy, earthy and smoky, but suffused with red fruits, savoury plum and wild flowers and herbs. A lovely stripe of tannin adds firmness on the palate, but it stays creamy and beautifully balanced with its cherry ripeness of fruit, smokiness and fine acidity. 1088 bottles produced. Tom: surprised that you gave the highest score to the white wine! Difficult to detect without having smelt the air of our terroir: the ambition being to represent that kind of lightness of the place se are lucky to live in. When we tried it, the Stramature definitely opened out and improved significantly (going from 90/100 to 92/100 for me) after it had been open an hour or two. So maybe they’re right about the 10 hour decant? But you’d have to decant it back into its own bottle to take to the table, surely?